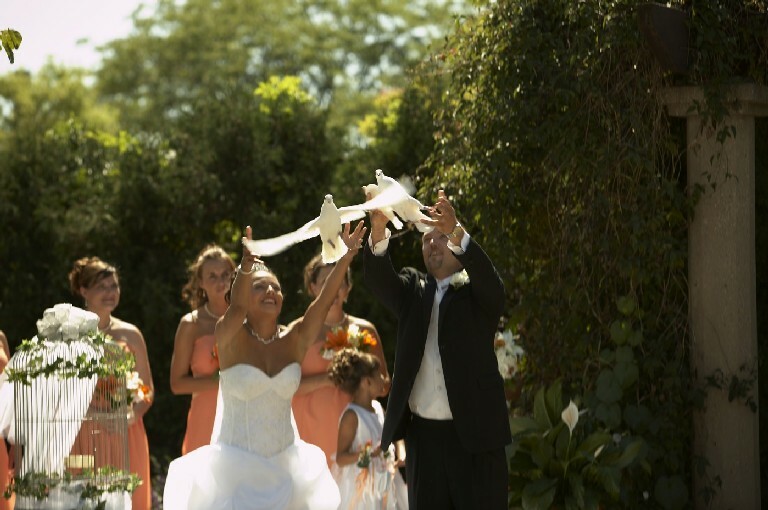 What better way to celebrate your wedding than with a breathtaking white dove release immediately after your vows? 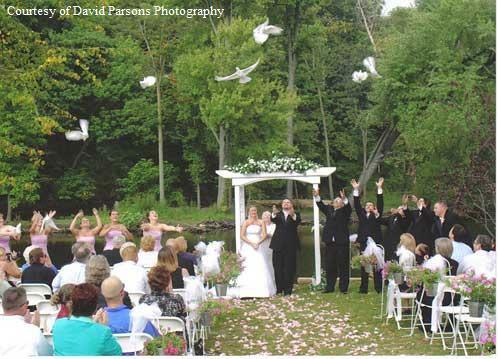 You and your guests will watch as your doves soar into the sky, circle higher and higher and fly away home to their loft. Very often this one spectacular event is what everyone remembers and talks about for many years to come. 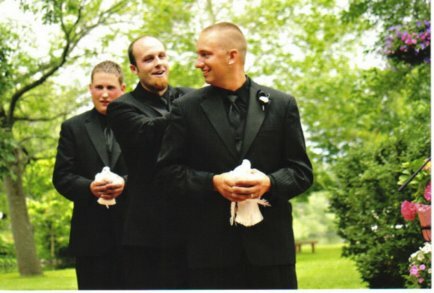 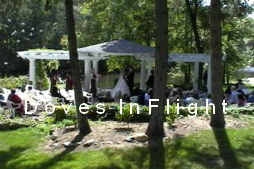 It also presents one of the best photo opportunities at your wedding. 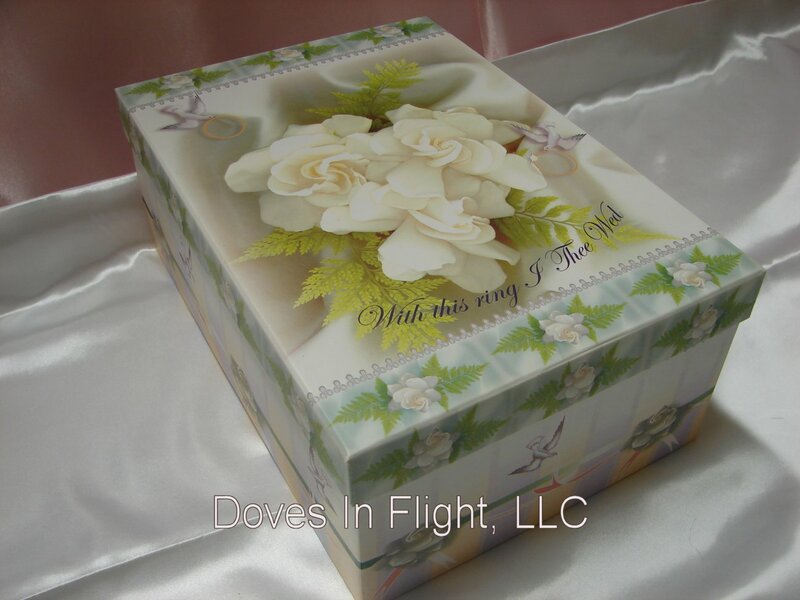 The white dove has come to represent all of Man’s hopes and dreams for tranquility and harmony; it is mentioned in the Bible and other significant teachings as a symbol of Love, Peace, Purity, Faithfulness and Prosperity. Doves mate for life and represent eternal commitment in many cultures. 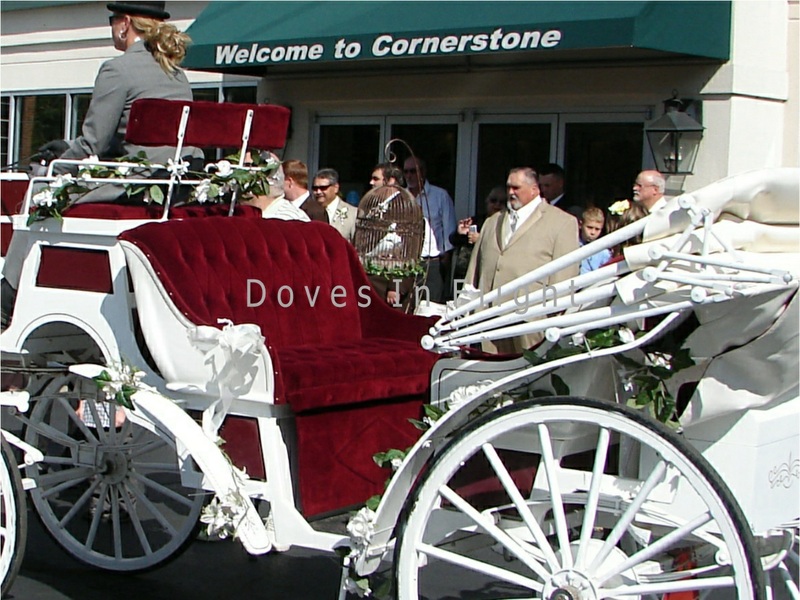 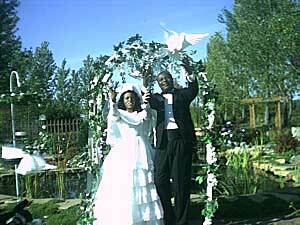 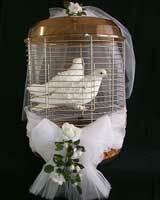 It is said that if a dove is seen on your wedding day, it will bring good fortune and prosperity! 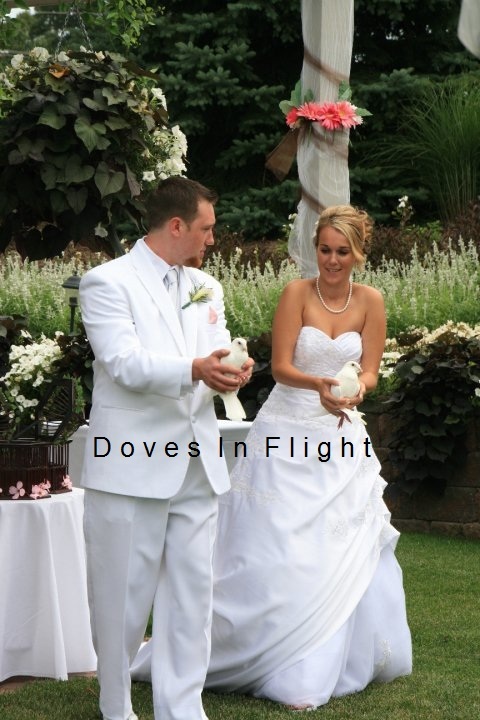 Our doves have been specially selected from quality stock for their stamina and performance. 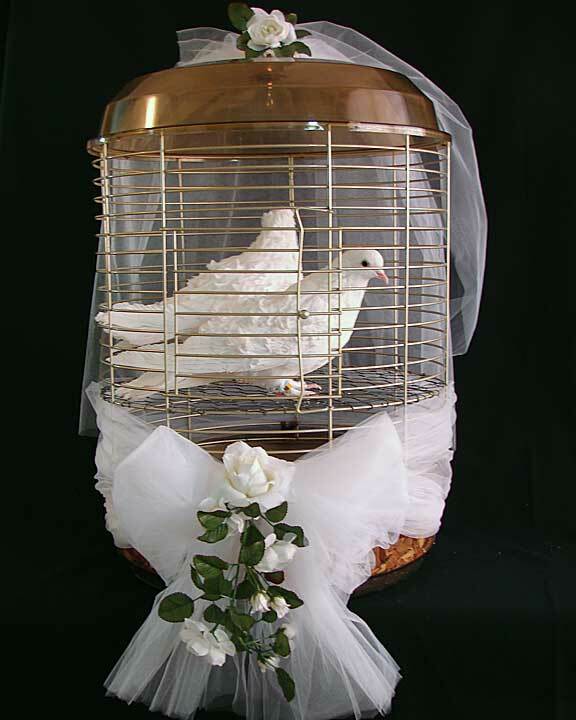 They are treated and vaccinated at their home loft to ensure that they will be clean and disease-free and that your release will take place without incident or worry. We carefully train our doves from a young age to come back to their loft from long distances and choose the best for ceremonial releases so you can be confident that they will return home to where they were raised. 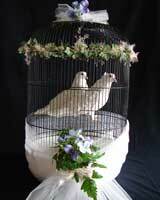 White ring-neck doves from pet stores are not suitable for dove releases. 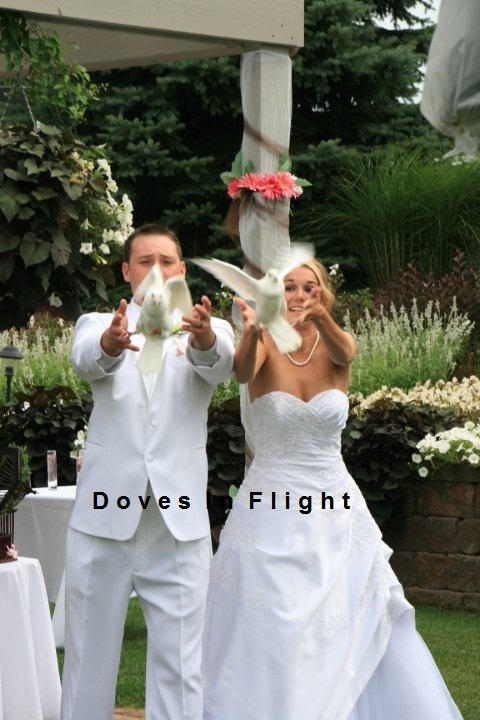 Please do not consider using them. 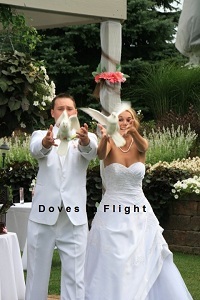 They are a different breed and will likely not survive for long in the wild. 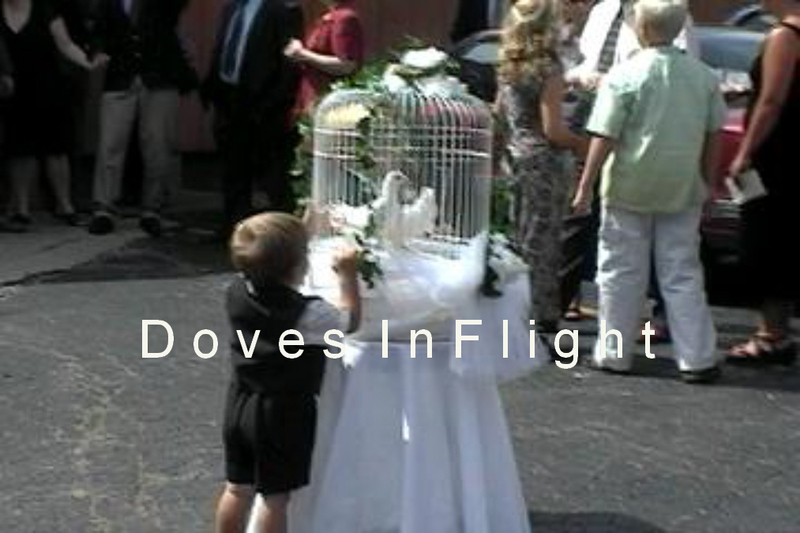 Your dove release can consist of as few as two white doves to as many as fifty. 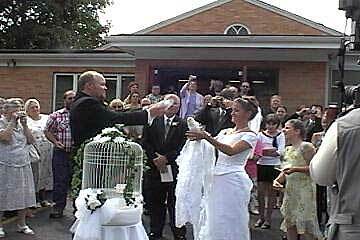 They may be hand-held for release or released from a basket or a cage. 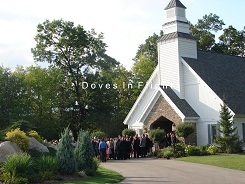 Traditionally, the bride and groom each release a single white dove in unison just after the first kiss (during an outdoor ceremony) or when exiting the ceremony (during an indoor ceremony). 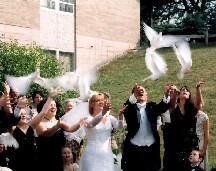 The additional doves are released from a cage just after the bride and groom release their pair of doves or they are released by the rest of the wedding party at the same time as the newly married couple. 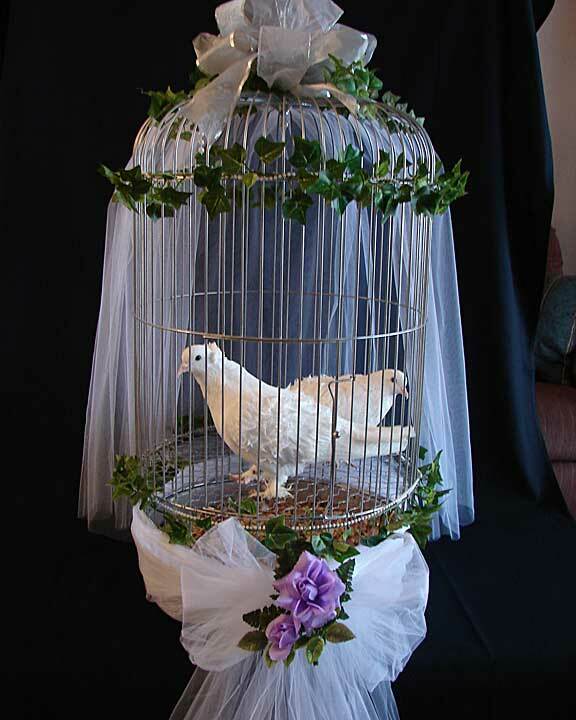 We have many different cage or basket options to choose from and we invite you to place two white doves in a decorated cage, with stand and linen, in the foyer of your church before and during the ceremony. Your guests will enjoy this special touch. Island Park, Eaton Rapids, Mi. 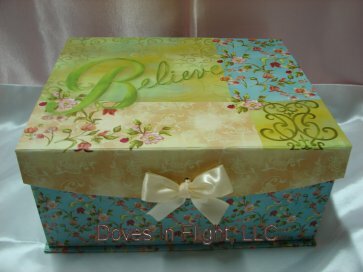 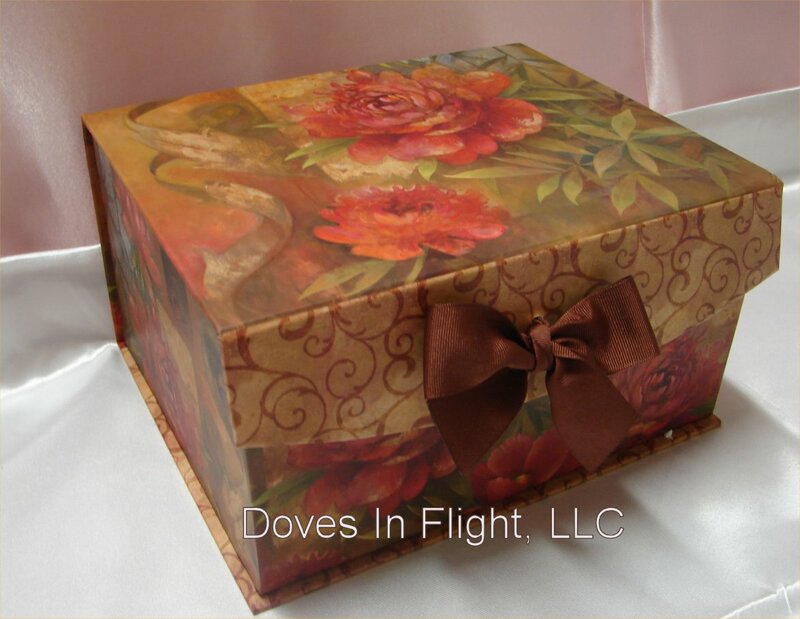 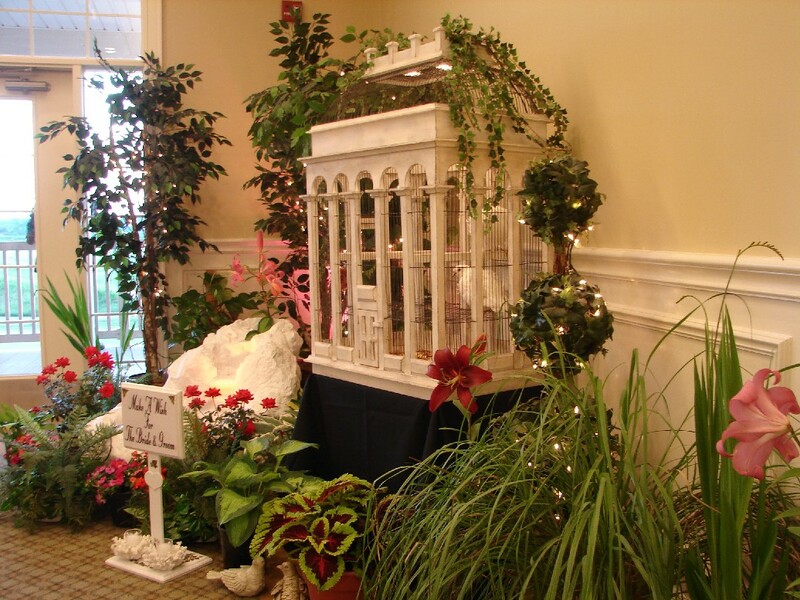 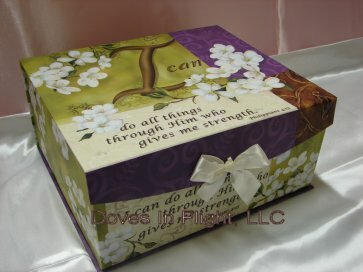 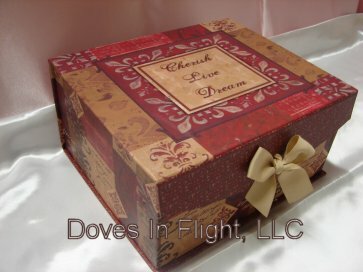 Choose from a variety of cages, baskets or "keepsake" boxes for your white dove release or reception hall doves. "With this ring, I thee wed"
"We love, because He first loved us"
"I can do all things, through Him..."
For your reception hall, we offer two white “frill-back” exotic doves in a choice of decorated cages, as a decorative item. 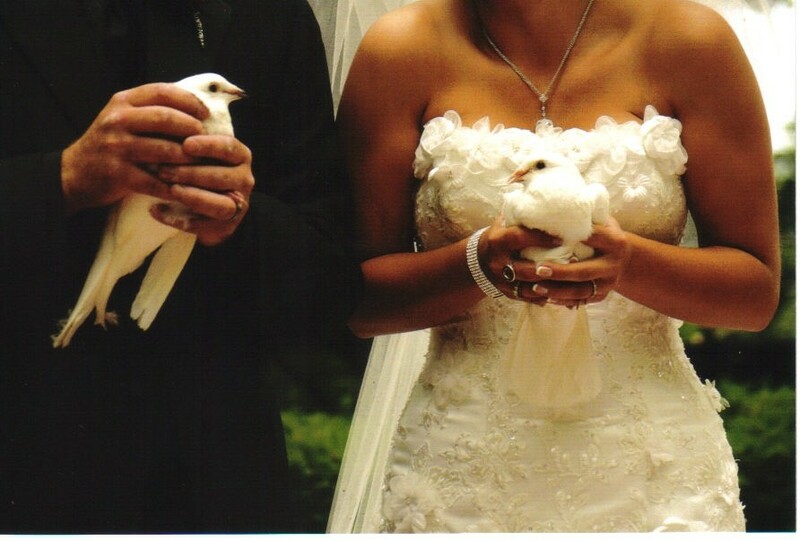 These beautiful doves have curled, snow-white feathers which resemble fine lace, a wonderful complement to the bride’s dress and to the decor of the hall. 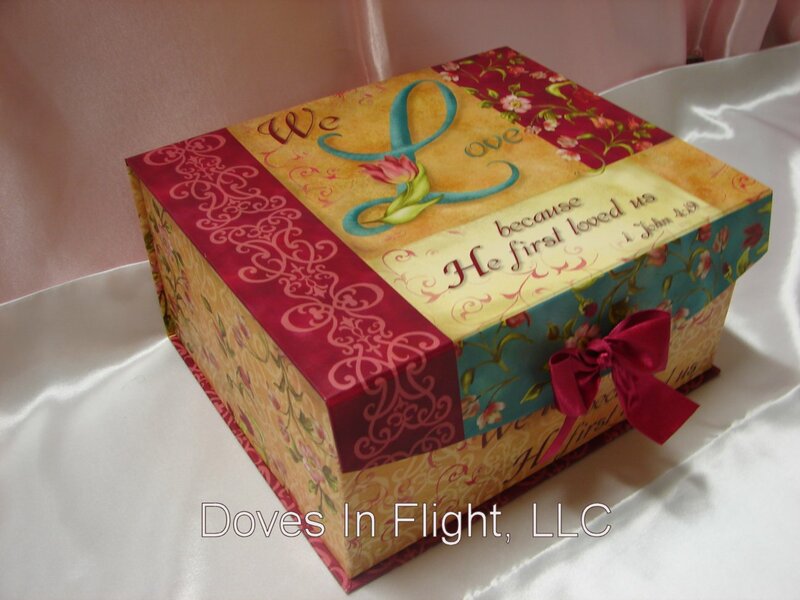 These doves are sure to be a hit with your guests.